Pass the honey, honey! This sticky sweet stuff has been on the table since as early as 2400 BC. Surprisingly, aside from tasting super dang good, it has incredible applications for your health. Read on for some honey-do’s that will leave you buzzing. One thing we need to clear up before diving into the hive is the difference between raw and processed honey. Raw honey comes straight from the hive to your kitchen. Its chemical makeup hasn’t been tampered with, unlike most of the honeys you’ll find in the grocery store (you’re probably familiar with the little plastic bear with a yellow lid). Most of these have been processed through intense heat and straining. This process leaves the honey a beautiful clear, amber color: however, it also changes the honey’s makeup by removing any of the wax, bacteria, and bee juju’s that are left behind. This might sound like a good thing, but it actually removes many of the proteins, nutrients, antioxidants, and minerals that would be beneficial to your body as well. Honey needs to be handled at a more moderate temperature to maintain its nutritional benefits. So become friends with your local bee people. They can get you the raw honey hookups! Important: Never give honey to children younger than age one. This is because adults have more developed immune systems than babies, who can’t process botulinum spores that might be found in honey. In addition, consult a medical professional before using honey as a medical substitute. 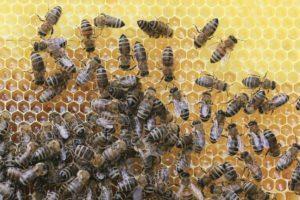 Though honey can’t do much for your jungle or disco fever, your hay fever and seasonal allergies can actually benefit from eating local, raw honey. Since bees are pollinating local flowers to produce their honey, you will probably ingest particles of the specific pollen from your geographical environment. Just like your immune system becomes stronger by fighting bacteria and viruses it is exposed to over time, a little bit of exposure to pollen and allergens through honey can eventually desensitize you to them. If your honey is processed, some of these benefits disappear with the heat. For thousands of years people have used honey to treat burns. One study done by the Mayo Clinic found that honey treated burns faster and more effectively than silver sulfadiazene cream, the antibiotic ointment commonly used to treat 2nd and 3rd degree burns. They found that honey led to enhanced healing, less scarring, and worked faster than the silver cream to sterilize wounds. With honey’s amazing antiseptic and antibacterial properties, it’s no wonder bees live off this golden ambrosia. Since raw honey tastes sweeter than white sugar and is absorbed much slower into your blood, it is the obvious alternative. This is especially true if you have an insulin disorder, like diabetes. The Glycemic Index runs from 0 to 100 and measures how quickly sugars are absorbed into your bloodstream: zero means it is absorbed at an extremely slow rate, and 100 would be absorbed almost immediately. Before being processed, raw honey falls at around 30-40 on the glycemic index. This is actually pretty awesome for a sweetener. It is important to note that processed honey falls at about 80-90 on the scale. That is the same as white sugar! This means that processing honey through heat and straining changes the way your body digests its compounds. Whether you have an insulin disorder or not, raw honey is a great option to help stabilize blood sugar levels. There’s nothing better than getting a cold sore right in time for your brother’s wedding. Smile! Luckily, honey can help with this too. Ninety percent of the population have the herpes-1 virus and forty percent get repeated cold sores throughout their lives. A study in Dubai actually found that honey works just as well as drugstore topical ointments to treat cold sores, and is even better at cutting down itchiness. That’s something to celebrate! Whether you enjoy nature’s candy in your food or drink, or you use it to treat your owies, this precious goo deserves to be appreciated. Find even more surprising uses for honey here.